Rev. Fr. Hakob Gevorgyan was born on February 2, 1978, in the village of Khor Virab in the Ararat region of Armenia. From 1984 to 1995, he attended the Margar Hovhannisyan Secondary School, and after graduation he was admitted to the Vaskenian Theological Seminary of Lake Sevan. After graduation from the Vaskenian Theological Seminary in 2000, he continued his education at the Gevorkian Theological Seminary of Holy Etchmiadzin, from which he graduated in 2001. On July 22 of that year, he was ordained as a deacon by Bishop Sepouh Chouljian, the Primate of the Diocese of Gougark. He took up a staff assignment at the Catholicate of All Armenians, where he worked for several years. In 2004, by the pontifical order of His Holiness Karekin II, the Supreme Patriarch and Catholicos of All Armenians, Dn. Gevorgyan was sent to Regensburg, Germany, to study in the Ostkirchliches (Oriental Churches) Institut, learn the German language, and undertake religious studies at the state university. He returned to Holy Etchmiadzin in 2005, and continued his work as an assistant to His Holiness. In addition, he was assigned as the sole administrator for the storehouses of Etchmiadzin’s Treasury House (museum) and Pontifical Residence. As an ordained deacon, he also had pastoral and ceremonial duties at the parishes of Khor Virab and Etchmiadzin. He was part of an educational movement to preach the Gospel, to organize pilgrimages to Armenia’s holy sites, and to make the church’s presence felt among the faithful. With the blessing of His Holiness Karekin II, he was ordained to the holy priesthood on December 9, 2007. At his ordination he received the priestly name Hakob. The Rev. Fr. Hakob Gevorgyan was invited by Archbishop Khajag Barasamian, Primate of the Eastern Diocese, to serve in the United States. He arrived in the United States on February 23, 2008, and began an internship program under the Rev. Fr. Karekin Kasparian at St. Gregory the Enlightener Church of White Plains, NY. Fr. Hakob completed his Clinical Pastoral Education (CPE) program at Westchester Medical Center in Valhalla, NY. Fr. 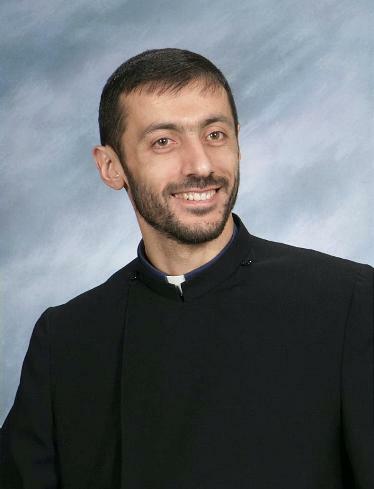 Hakob currently serves as pastor of Holy Trinity Church of Cheltenham, PA. He and Yn. Anna have been married since 2007. They have two sons, Narek and Vartan.